In 2012, actor Paterson Joseph played the role of Brutus in the Royal Shakespeare Company’s acclaimed production of Julius Caesar, directed by Gregory Doran. Now, in a book published this week, Joseph shares his experiences rehearsing his part, working with a majority-black cast, and investigating audience reactions to the play. In the below excerpt from Julius Caesar and Me: Exploring Shakespeare’s African Play, Joseph unpacks some of the history of Shakespeare’s plays in Africa, particularly the translation work done by Julius Nyerere. Paterson Joseph is in the United States this month, performing his one-man show Sancho: An Act of Remembrance at the National Black Theatre in New York. Why did the remarkable leader Julius Nyerere, at the height of Tanzania’s struggle for independence, feel the need to translate this most English of authors into Kiswahili? Julius Kambarage Nyerere was known as ‘Mwalimu’, The Teacher, by all who knew him. He was the first Tanganyikan to receive a Master’s degree after graduating from Edinburgh University in 1952. On his return, he gave up his teaching career and set about transforming the Tanganyika African National Union into a formidable force for independence from British rule. In 1962, he became the first president of the newly independent Tanganyika. After merging with Zanzibar, the fledgling African country was subsequently renamed the United Republic of Tanzania. Nyerere’s ideas for advancing his people were simple, though revolutionary, ones: rely on self-sufficiency in your economy; take no money from the International Monetary Fund or the World Bank; and above all, rid yourself of colonial language. In this way you free the mind of your people to think independently. As a teacher, he believed education was key and that education, he insisted, should be in Kiswahili. Tanzania became the first country in Africa, after the end of colonial rule, to choose an African language as its national language. Kiswahili, the language of the Eastern Coast, was spoken by a wide variety of peoples. It was a mixture of Bantu languages and Arabic and had been used as a trading language for hundreds of years. The fact that Nigeria, Ghana, Mali and Senegal, for example, all chose the colonial language as their national tongue, demonstrates how unique and far-sighted Mwalimu was. The unity that this brought to the more than one-hundred tribes in Tanzania, is evidenced by the relatively peaceful history it has enjoyed since the ending of British rule. Mwalimu Nyerere tested this native language with the writings of the greatest exponent of creative writing that the colonists could offer: Shakespeare. He translated three plays into Kiswahili: Macbeth, The Merchant of Venice and, first, Julius Caesar. Juliasi Kaizari demonstrated the versatility of this African language – showcasing its ability to encompass the intricacies of the great original. Other African versions of the popular Julius Caesar include translations into several South African languages: Tsonga, Northern Sotho, Xhosa and Tshivenda. The best known version, however, is in Setswana by renowned South African writer and founding father of the African National Congress Sol. T. Plaatje, translated way back in the 1930s. The interesting thing here is that Shakespeare was chosen as the epitome of Western literary and dramatic art. A sure-fire way to count yourself educated would be to know your Shakespeare. In fact, many African countries rejected outright – or treated with understandable suspicion – the literary canon of their old colonial oppressors. The books that might well survive would be, a la Desert Island Discs, the Bible and The Complete Works of William Shakespeare. So, in Nyerere’s mind, a Kiswahili translation of a Shakespeare play would prove that this native language was capable of conveying the highest form of literary and artistic expression available in the Western world. A glittering prize, indeed, and one-in-the-eye of the old masters. We may contrast Mwalimu’s decision with the choice of the Kenyan leaders who, possibly, could not believe they’d resolve their national differences with the use of a lingua franca like Swahili. Nyerere saw the moral imperative as unity. Jomo Kenyatta of Kenya, perhaps less visionary, less interested in language than his neighbour down the coast, left his country to speak English as the official language and to simultaneously continue using their own native tongue. I had the personal privilege of meeting him many years ago, in 1962, when I visited Tanzania seeking help as we embarked on the armed struggle. Then, as now, I was struck by his lucid thoughts; his burning desire for justice everywhere; and his commitment to Africa’s interests. After the independence of Tanzania, Mwalimu, as its head of state, continued to play an important role in the struggle for justice and democracy, not only in Africa but throughout the world. The mirror of Caesar’s story was clear: a charismatic leader, the legitimate source of national pride, disfigured by selfish ambition and avarice. Robert Mugabe of Zimbabwe, Idi Amin of Uganda, Ahmed Sekou Touré of Guinea – all of them fought for freedom from colonial rule and all succumbed to the seduction of power; silencing all opposition in the belief that they were the only ones who could unite their country. Not, as some lazy critics have tried, patronizingly, to suggest, that any of us thought it was the only African story, just a sadly common one. 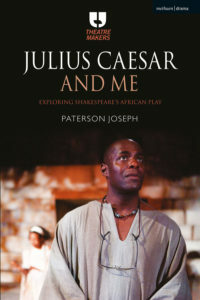 Excerpted from Julius Caesar and Me: Exploring Shakespeare’s African Play. Copyright © 2018 Paterson Joseph. Used with permission of Methuen Drama. Hear more from Paterson Joseph in our Shakespeare Unlimited podcast interview on Julius Caesar and Me.